Called "The Omen" after Jerry Goldsmith's famous oscar-winning soundtrack, this double album is a collection of some of his greatest music. The tracks are either main themes as originally played on the soundtrack, or frequently they are performance suites for the concert hall or recordings. The Omen title track is one excellent example of the latter, consisting of some of the best moments from the movie soundtrack remixed into a chilling 12-minute suite ably sung by the Crouch End Festival Chorus augmenting City of Prague Philharmonic Orchestra under Nic Raine. Other films featured extensively in suite form on the album include "Under Fire" complete with Spanish guitar, "The Swarm" with two buzzing tracks, "The Blue Max" with its aerial heroics, "First Knight" with more dramatic choral music, and a full 16 minutes of Goldsmith's music for "Star Trek" including for good measure Star Trek: Voyager from the small screen. Some shorter tracks are no less deserving. In introspective mood, there is the haunting main theme from "Basic Instinct", the Love theme from "The Russia House", the lyrical theme from "Powder" (which has been released as a song on an album by Sarah Brightman). In more boisterous mood, we have the romping overture from the caper movie "The Great Train Robbery", the super hero style "The Shadow", the steely determination of "Rambo", the military marches from "Macarthur" and "Patton" and the hard-hitting science fiction dramas "Capricorn One" and "Total Recall". 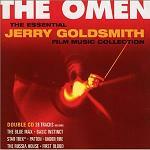 The album as a whole is great value for money, giving you the chance to sample some of Goldsmith's prolific film output. More information and prices are available from: Amazon.co.uk in the UK, or Amazon.com in the US.